TORONTO, ON – Six Pints Specialty Beer Company – the craft and specialty brand division of Molson-Coors Canada – has announced the launch of a unique new brewing facility in downtown Toronto. 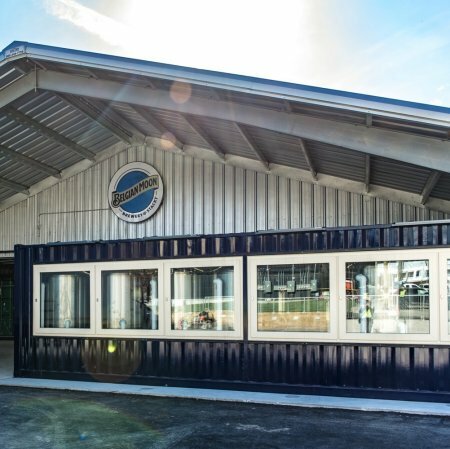 Belgian Moon Brewery – the Canadian trade name for the Blue Moon brand – has opened a mobile brewery and taproom at stackt, a retail market and community hub at the corner of Bathurst and Front that has been constructed out of 120 reclaimed shipping containers. Equipped with the highest brewing technology, the Belgian Moon brew team will brew fresh and directly onsite, leveraging this unique opportunity to produce small batches of popular variants available in the U.S., such as Mango Wheat, and to test new, seasonal recipes with trend and community influence. Stackt opens to the public today (April 10th), and the Belgian Moon Brewery will be open from 11:00 AM to 11:00 PM Sunday to Wednesday, and 11:00 AM to 12:00 midnight Thursday to Saturday.